Provides practical suggestions for use in the classroom, questions for discussion and additional activities with each chapter. Discipline-Specific Writing is key reading for students taking courses in English for Specific Purposes, Applied Linguistics, TESOL, TEFL and CELTA. "Flowerdew and Costley have brought together an outstanding group of authors for this volume. 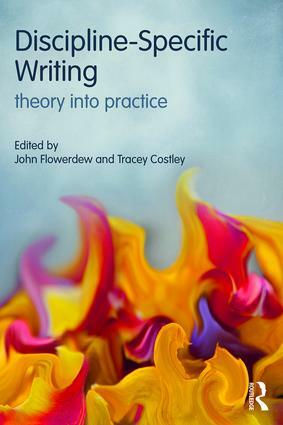 The chapters bring together theory and practice in a way that is both highly readable as well as extremely useful for teachers of discipline-specific writing. An excellent publication." "This book demonstrates the value of research-informed teaching. Research on disciplinary writing is extended into practical considerations for the teacher in the classroom. The multiple research perspectives, teaching strategies and pedagogic considerations raised in this book will make it an enormously useful resource for researchers and teachers." John Flowerdew is Professor Emeritus at City University of Hong Kong and is now based in the UK, where he is a Visiting Professor at Lancaster University. Tracey Costley is a Lecturer in the Department of English Language and Linguistics at the University of Essex, UK.